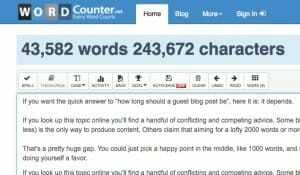 Blog > Resources > How Much Does The Average Website Content Writer Make? 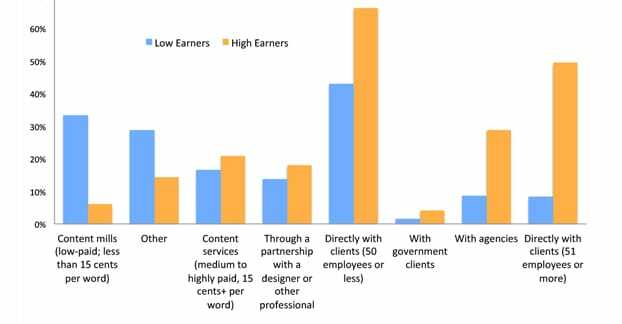 The other day, Pam Neely shot over this link, to a study of freelance writers throughout the Internet, and how much they earn from writing content. It’s a fascinating topic, so thanks to Pam for sending it along. Let’s discuss the results, shall we? First of all, I immediately dug into the PDF of results of the survey and looked where they talked about their methodology for harvesting data. Content Wonk did a pretty good job of harvesting data from a variety of sources, rather than just “SEO writers” or what have you. 5,375 people visited the site of the survey. 1,308 people actually filled out the survey. That’s a bit under a quarter of all visitors, so pretty decent. 1,302 people actually made it through the filters, which is an excellent rate. Those remaining six people were probably obviously fake answers or answers from non-writers. In order to reach people, Content Wonk spent some cash on advertising directly to freelancer writers on Facebook and Twitter. By their own admission, Twitter ads worked very well, while Facebook did not. Content Wonk also reached out to freelance writers via their websites when such sites existed, as well as through writer directories. They also followed nearly 8,000 people who had “freelance writer” in their bio on Twitter and, if they followed back, sent them a DM asking them to take the survey. Finally, they incentivized the survey by offering prizes to randomly selected participants. Prizes ranged from paid article promotion to Amazon gift cards. There are three concerns here that can skew the results of the survey, and are worth keeping in mind. First, taking primarily to social media and website-based means of contact tends to exclude more traditional freelance writers. There are in fact many freelance writers who do almost all of their work with print journals and newspapers, or even with novelists who hire ghostwriters. To expand the survey results over a longer period of time, I might recommend running ads in print and literary journals, posting on Criagslist in the writing/editing sections in major cities, and perhaps even a campaign or group on LinkedIn. There are also ways to reach writers on Facebook that don’t involve ads; applying to Groups or talking to admins of Freelancing Pages would help as well. This also eliminates a lot of the more tech-savvy freelance writers who tend to use an ad blocker or an app like FBPurity for their social media. Plenty of people these days browse the web with the majority of advertising turned off, meaning the ads that promote the survey would never be seen. Second, the follow-back DM method of Twitter solicitation is always going to have a low success rate. It’s fairly rare these days for someone to follow back based solely on a follow; the have to like something about the profile following them. No offense to Content Wonk, but if a content promotion company followed my personal Twitter I would be more inclined to think it was spam than to follow it back. This means there’s not actually a lot of return from that avenue of promotion. Rather than fishing for a followback and then sending a DM, I would try a pinned tweet addressing freelancers in general, and specific tweets mentioning target freelancers, perhaps even replies to them posting about writing. 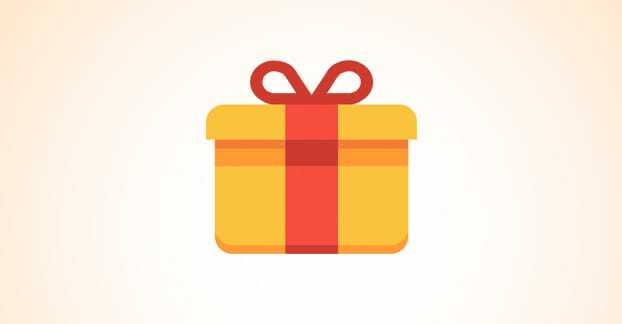 Third, incentivizing a survey means there could be some plausible-but-false results from people simply taking the survey for a chance at the rewards. This isn’t as big a problem as it could have been, given that the main prizes were content promotion, but it’s still an issue. I know a lot of times freelancers are ghostwriters. They don’t need or want blog post promotion services, since the promotion doesn’t benefit them directly. For those of us who write under our own names, such promotion can be useful, though. That alone brings up an interesting point; people who write for themselves versus people who ghostwrite. People who ghostwrite don’t have need of promotion services outside of their own personal blogs and guest posting. People who write for themselves would make use of that promotion, but have an interesting effect on the survey; dragging down the average. 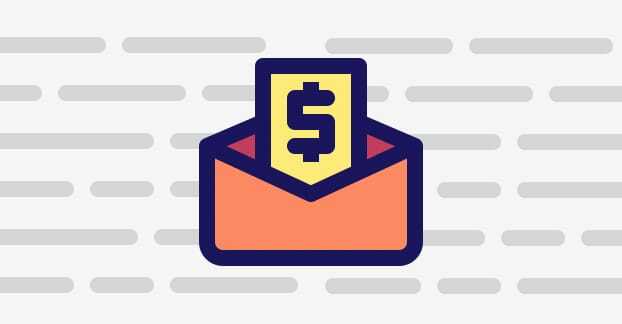 After all, even if you consider yourself a freelance writer, a guest post isn’t likely to pay you, so your hourly rate for writing is lower. That said, I would have to take the survey myself to analyze whether these issues are accounted for in the construction of the questions or not. In any case, with over 1,300 responses, Content Wonk was able to come up with a good amount of data, which has some interesting results. One interesting choice is the decision to ask for a per-hour rate rather than something more typical for freelance writers. The content mills, for example, pay by the word. 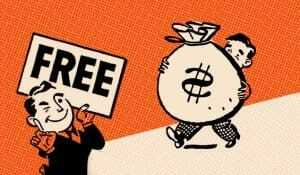 Often, freelance writers will charge by the word, or by the project, not by the hour. Estimating a per-hour rate is tricky when you’re paid by the project or paid by the word. For example, if I’m getting $100 for a 2,000-word article, what is that in a per-hour rate? Well, it depends on how long it takes to write. I personally write dozens of posts per month on a variety of different topics. Sometimes a 2,000-word post will take an hour to create. Sometimes it will take three or four hours. That means that one project could be getting me $20 per hour or $100 per hour. If the topic is something I’m exceptionally in the zone writing about, I could even pull it off in half an hour, making the “hourly” rate technically $200. A per-hour rate also might assume more consistent work. Someone pulling in $15 per hour sounds like they’re less successful than someone making $100 an hour, but if the person making $100 an hour only works two hours a week, where the person making $15 an hour works 40 hours, the “cheaper” rate is winning in terms of making a living. Anyways, taking a per-hour rate in stride, let’s see what the data has to say. Out of the 1,302 responses to the survey, 27.8% of them fell into the low earners category, which was classified as under $15 per hour. 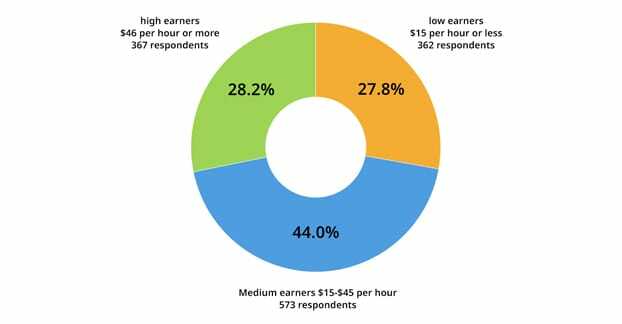 44% of the earners made between $15 and $45 per hour, while the remaining 28.2% made $46+ an hour, classified as high earners. This is a fine metric on its own, but it needs context, and context is immediately provided. 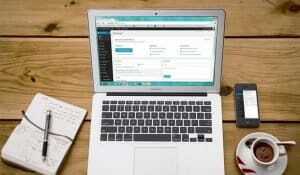 Recurring work is extremely important for a freelance writer. A stable of reliable clients is the difference between living in a frantic scramble to make money with a day job and writing on the side, and being able to write for a living full time. Low earners had as high as a 15% rate of “no recurring work” and an additional 15% “very little recurring work”. High earners, by contrast, were under 3% for both categories. The question here is one that’s a bit of a chicken and egg problem. 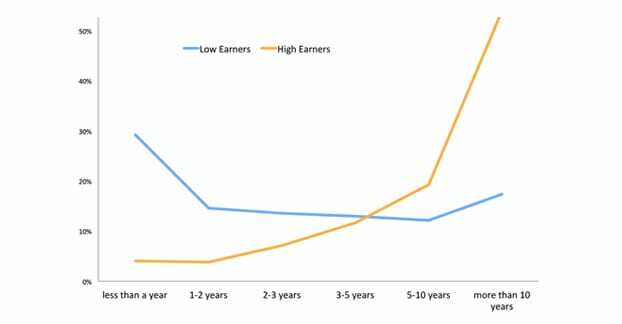 Do the high earners earn a lot because they have recurring clients that value them and pay them more due to their relationship? Or do the people who pay more for consistent work attract reliable writers? I don’t have an answer for you here; I suspect a little of both. The reliable writers attract the recurring work, and the reliable clients attract the reliable writers. Persistence pays off, as the data shows. Experience matters. The majority of high earners have been writing for a long time, five or more years. 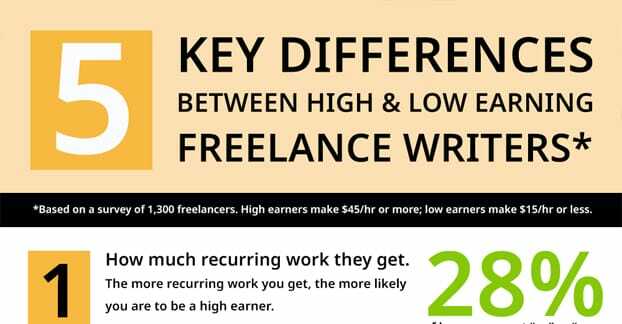 54% of high earners in the survey have been writing professionally for over a decade. Meanwhile, only a small fraction of writers – 4% – break into the “high earner” category in their first year. It really takes a stroke of luck and the ability to follow up on the opportunity to make it that quickly. The longer you’ve been writing, the more you’re typically making. Only around 15% of low paid writers have been writing for over five years. I would imagine many of those people are writing casually, rather than attempting to make a career out of it. I know a lot of people who would identify as a freelance writer – at least, would identify as one for a chance at a $25 Amazon gift card – who only write casually, enough to earn some weekend fun money and nothing more. Based on my own experiences, the experiences of the more successful freelance writers I know, and the results of the survey, I can deliver a few points of advice that should apply to just about any freelance writer looking to improve. First of all, stick with it. If you want to make a career out of writing, you need to put in the time. A lot of success comes down to meeting the write people, and you’re not going to be able to jump in as an inexperience newbie and make the right kind of connections. Serious clients aren’t going to entertain someone with no portfolio and no recommendations, after all. That’s not to say that you need to do your time in the grunt mills. Content mills like Textbroker have so little room for advancement that they’re more just for filler and education. You can make some money, you can get the hang of the style guide, but once you’ve done your time you should pack up and move on to better paying gigs. Where do you find those gigs? Well, according to the survey, clients come from a handful of different sources. You can get hired on as a writer working for a content production agency, which is like a step up from the content mills. You can take a further step up and partner with another freelancer, a designer or professional making sites who can sell your content production services. In fact, a good portion of high earners work with the high-end boutique content production groups. Otherwise, the ideal hookup seems to be working directly with various businesses. Small businesses, those with 50 or fewer employees, make up the majority of high earners. A majority of the minority come from working with businesses with over 51 employees, so the vast majority of high earners are working directly with businesses. There are a few ways you can find these kinds of positions. 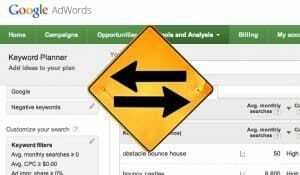 Many businesses will post job openings, either on their own websites or on job markets like Indeed. Sometimes recruitment agencies like the Kimble Group, or even just individual recruiters on LinkedIn, will refer you to a variety of jobs. Putting in the time leads to improvements, both in position, in clients, and in quality of production. Low earners, according to the survey, spend dramatically less time per week working. 45% of them spend less than eight hours per week, which suits my assumptions that they’re casual part-time workers that have day jobs. Meanwhile, high earners work anywhere from 8 to 40 hours a week. Very few writers of any stripe work more than 50 hours a week, though those that do tend to be high earners simply due to the practice. Practice does, after all, make perfect. The more time you spend writing, the more you can get in the groove and produce the kinds of high quality content that please high-end clients. So, my advice isn’t exactly novel, but it’s backed up by the data. Spend the time. Work a day job if you have to, but work at writing at least 10 hours per week. Strive to improve the quality of what you produce, and keep an eye out for further opportunities. Get in with clients who might not have long-term prospects, simply because a huge portion of high earners get their work through client referrals or their own personal connections. Meanwhile, you don’t have to waste time where it won’t have huge returns. A lot of the more successful freelancers I know – and many respondents to the survey – don’t have websites, for example. A website can help, and I would venture to guess that they’re overly represented since one of the methodologies of the survey was to send it to freelancers who have websites. Niche also doesn’t matter too much. Everyone has a blog, and everyone needs content, so everyone can pay appropriate rates for it. It’s that simple. Have you read the survey? I recommend giving it a look, whether you’re a writer or a potential client. You can learn a lot about how much a writer should be paid, though just from me to you? Pay them a little more. When you have a reputation for being a well-paying client, you’ll have plenty of writers willing to produce excellent content and be loyal to you. Hi Rajon! Most content mills (like Textbroker) have a writer’s test where you write an article and they evaluate your article for quality; Textbroker’s case, out of a score of 1-5 stars. Getting a 5 is pretty much impossible; I’ve seen expert writers get a 4 stars which is funny considering they have a master’s degree in English and published works. So if you get a 3 or a 4 you are in good shape, regardless of if you’re bi-lingual or not. Give it a shot for a month and see how well it works for you! Write your best articles and complete your jobs on time and you will certainly earn extra money. Let us know how it goes!